Your world is moving fast. Competition for top talent is getting fiercer. And your clients want better results today – not tomorrow. Staffing and recruiting firms need to act more quickly than ever before to find talent, reduce time-to-fill, and stand out in an overcrowded industry where innovation, efficiency, and service are key differentiators. 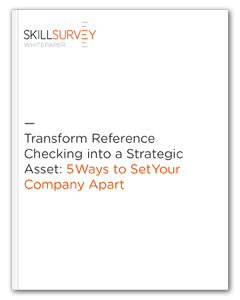 Discover how you can turn reference checking into your secret weapon in our whitepaper: Transform Reference Checking into a Strategic Asset: 5 Ways to Set Your Staffing & Recruiting Firm Apart.